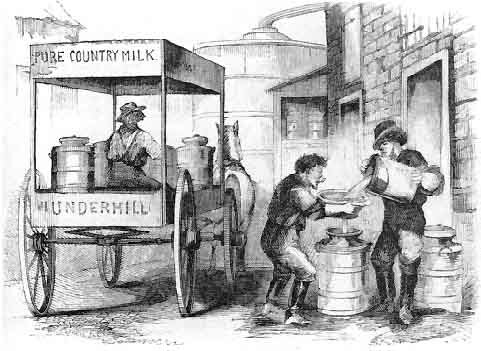 November 20, 1897 – Warrants are sworn out for the arrest of 55 milk dealers who are charged with selling milk and cream below a standard mandated by city ordinance. For two weeks, the Milk Inspection Bureau has been collecting samples of milk from the wagons of dealers, and these 55 dealers are the first to be charged with their arraignment scheduled for November 23. Folks who lived in the rapidly growing city were far removed from the cows that provided their milk, so milk sellers “acted as middlemen between farmers and townspeople .., [and] were widely mistrusted and said to possess neither character, nor decency of manner, nor cleanliness.” [neatorama.com] It was common to dilute whole milk with water or other substances, which was not only an illegal practice but a dangerous one since no one knew the purity of the substance with which the milk was diluted. Add to that the “swill milk” practice by which distilleries kept herds of dairy cattle on the premises, fed the cows the residue of the alcohol manufacturing process, and milked the sorry creatures until the day they died. Because this milk was thin and had a bluish color, distillers added flour, starch, chalk or plaster of Paris to make the milk sellable. In the early 1890’s the city created an ordinance that finally got around to dealing with the problem. One section of the ordinance is pretty emphatic, not to mention graphic: “Whoever, by himself, or by his servant or agent, employe or milk wagon driver, or as the servant, agent, emplye or milk wagon driver or any other person, firm or corporation, sells, offers for sale, exchanges, delivers or transports or carries for the purpose of sale, exchange, or delivery, or has in his custody, possession, care or control, with intent to sell, offer for sale, exchange or delivier, or express or offers for sale, exchange, transportation or delivery, any milk or cream, for human food, which is unclean, diluted, impure, unhealthy, diseased, unwholesome, adulterated or not of the standard of good quality provided for by this ordinance, or milk or cream produced from sick or diseased cows, or milk or cream produced from cows kept in an unclean, filthy or unhealthy condition, or milk or cream from cows fed on the refuse or slops from distilleries, vinegar factories or any similar slops, mash or refuse or on any other than good or wholesome food, or milk or cream that has been exposed to, or contaminated or affected by the emanations, discharges or exhalations from any human beings or animals sick with any contagious or infectious diseases by which the health or life of any person may be endangered, compromised or in any way affected, shall be deemed guilty of misdemeanor and, on conviction thereof, shall for a first offense be punished by a fine of not less than twenty-five nor more than one hundred dollars and for each subsequent offense by a fine of not less than fifty nor more than two hundred dollars.” A misdemeanor and fine wasn’t much, but at least it was a start. November 20, 1907 – The president of the South Parks Commission, Henry G. Foreman, proposes a set of plans that will move the city closer to becoming the “Paris of America.” [Chicago Daily Tribune, November 21, 1907] The huge plan involves widening Michigan Avenue north of Twelfth Street to seventy feet with a space for plants and flowers and trees 16 feet wide on the east side of the street. “Huge vases or urns filled with brilliant flowers or green vines placed at intervals along the curb – that is the dream of Mr. Foreman which has a good chance of becoming a quick reality ...” reports the paper. Jackson Boulevard would also be improved with additional lighting, floral displays, and the removal of canopies and signs on the street. Foreman says, “These boulevards downtown should be boulevards in something beside the name. 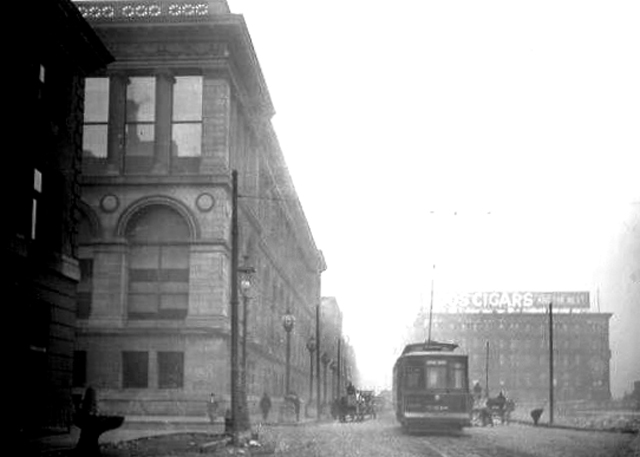 I feel sure that a small expenditure for improvements of such character as I have suggested would transform Michigan avenue and Jackson boulevard from their present appearance of ordinary city streets, and the change would be most welcome to all the people.” The grainy photo above from the Chicago Daily News archives, taken in 1908, looks north from Washington Boulevard and shows that Michigan Avenue could probably have stood some improvement at the time. November 20, 1942 – Fire Commissioner Michael J. Corrigan blames the lack of water hydrants for complicating the extinguishing of a massive fire at the 82-acre Chrysler B-29 engine plant under construction on a site bordered by Cicero Avenue and Pulaski Road on the east and west and Seventy-First and Seventy-Seventh Streets on the north and south. The power plant for the facility is destroyed before the flames can be brought under control in a 3-11 alarm fire that forces fire fighters to run hose lines for more than a mile along Cicero Avenue. Ground was broken for the massive plant in June of 1942 with construction following designs by architect Albert Khan, plans that used half the steel that conventional plants of similar types had used. By March of 1943, despite the fire, “16 buildings at the complex had come on line. The complex ultimately used 4.3 million bricks, housed over 6,000 machine tools, had 23 cafeterias for thousands of employees, was able to handle 10 million gallons of water a day . 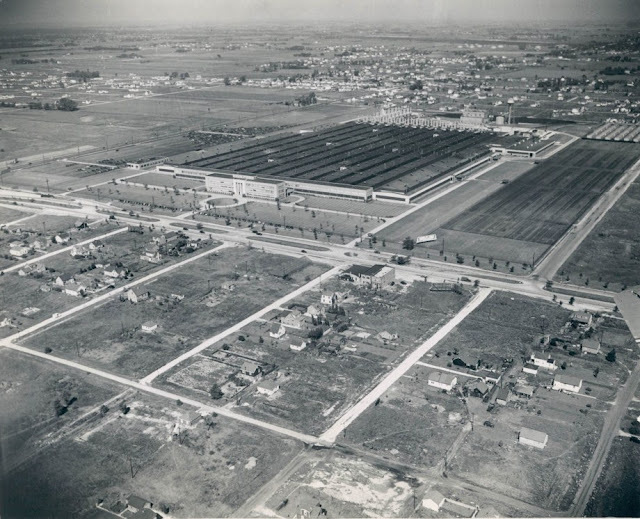 . . Over 16,000 were employed in building the plant; and 1,200 Chrysler personnel were involved in planning and layout of the manufacturing.” [www.allpar.com] Today as you pass by the headquarters for Tootsie Roll Industries and the Ford City shopping mall on Cicero Avenue, you are looking at a site that once turned out 18,413 engines for 3,628 B-29 airplanes.